We would like to dedicate our website to all those Full Circle Farm Sanctuary residents who have passed on as well as to all the countless farmed animals around the world who continue to languish in fear and suffering, only to experience horrific deaths each and every day. Scroll down this page to discover more about our beloved residents whose spirits live on in the hearts of those at Full Circle. Viva, a scrappy little hen who was the sole survivor of a neighborhood flock running loose in Asheville was brought to us by a kind woman who found her lying injured on her doorstep. Viva's head was bloody when found after an apparent predator attack. Viva was essentially blind when she arrived at Full Circle and could not find her feed container or water fountain without help. Happily, she was gently taken "under the wing" of one of our resident roosters, Merlin, who gently guided Viva to the food and water containers while softly vocalizing, urging her to eat and drink. This was a touching sight to behold. The two became inseparable lifelong friends. We are happy to report that, with treatment, Viva gradually recovered her eyesight. 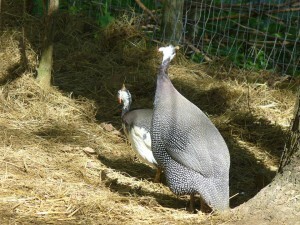 She passed away as an elderly bird surrounded by love and tender care. Her plucky, determined spirit will be ever missed here at FCFS. ​Victor the rooster was found by a caring woman near Charlotte after he had fallen off a transport truck on the way to the slaughterhouse. Injured and physically challenged by his massive body size due to being genetically bred to grow quickly and unnaturally large for the meat industry, Victor was extremely lucky to have found his way to a loving home. Most so-called "broiler" chickens are not so fortunate. 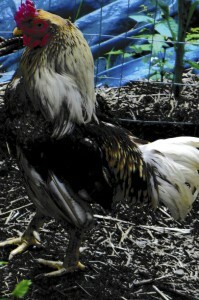 After an examination, it was determined that Victor suffered from bumblefoot, a serious infection of the foot, common in the "broiler" chicken industry. With vet care and our own daily treatment plan, Victor's bumblefoot condition was healed! We provided him with herbs to boost his immune system and respiratory function...and we gave him something else that he was not accustomed to: love and freedom to enjoy the sunshine and the grass under his feet. It was such a delight to watch Victor spread out his wing while sunbathing and chatting with his hen companions. He lived out his life in a peaceful, spacious environment surrounded by considerable love. What a special boy! ​Merlin was a gentle wizard to be sure. He arrived here after a concerned woman contacted us regarding his situation. It seemed that Merlin had been wandering an Asheville neighborhood for some time, without anyone to truly care for him. She would leave out food for him but was worried about him surviving both predators and the approaching winter, and rightly so. She captured Merlin and brought him here, and so began his new life at Full Circle. Besides his outer handsomeness, Merlin possessed a genteel charm, especially in the company of his new friend, our special needs little hen, Viva. Before Viva regained her sight, Merlin would gently, knowingly guide her to the food and water bowls, sweetly vocalizing, urging her to partake. It became clear to me that Merlin sensed her weaknesses and injuries and so he remained extremely gentle, patient and understanding with her. I feel blessed to have witnessed his inspiring thoughtfulness and empathy for another in need of kind assistance. Merlin's presence lingers on in our hearts. ​Dehlia, like so many other hens on factory farms and small, local "free-range," organic farms alike, found herself unwanted by her "caretakers" after her egg production had declined and she no longer remained 'valuable' to them. 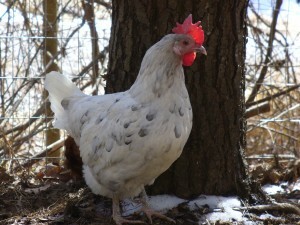 We happily welcomed Dehlia to our circle where she never was required to lay a single egg; for Dehlia's true value had nothing to do with exploiting her for profit. A happy, gregarious hen at heart, Miss Dehlia proved herself to be a fearless born leader who loved to chat with the other girls. Many were the moments when she would quietly walk up and peer intently into my eyes as I knelt down and then begin her commentary on the day's goings-on around the barnyard. How I adored our chats as she would sit in my lap while I gently pet her fluffy feathers. She was a true, faithful friend to the end. Miss you, Dehlia. ​Like so many of our hens here, little Hope was the victim of a "caretaker" who had no use for her since her egg-laying had waned. Immediately we noticed a very foul odor coming from Hope and promptly took her to our avian veterinarian. Sadly, Hope was diagnosed with an advanced stage, inoperable malignant tumor which was causing her considerable pain. Humane euthanasia at the vet's office was the compassionate thing to do to relieve Hope's misery. She passed on surrounded by love and knew no more pain. Brief was her stay here, long does she remain in our hearts. ​Luna's inner light shone as brightly as her pure white feathers here at the Circle. In the evenings after all the other birds were perched in their coops, Luna would often greet me at the gate as I made my rounds to lock everyone up safely for the night. I would gently pick her up and carry her to her coop and bid her pleasant dreams. Luna may be gone, but never forgotten. ​Lorna was one special lady and we so cherished her calm presence here. Friendly and approachable, she will always own a special place in our hearts. Lovely Lorna was saved from a situation of severe neglect and spent contented years with us at Full Circle. ​So many have commented on what a lovely girl our Amelia was. 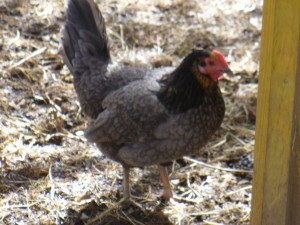 She spent a few years with us after having been dumped off by a "backyard chickener" who wished to dispose of her due to her decline in the egg-laying department. This is such a tragically typical attitude of those who exploit animals for their own desires. Beautiful Amelia loved hanging out with protective Beau, one of our roosters, and she remained the "head hen" in their little red coop the entire time she was with us. I can still picture her basking in the sunlight with one of her wings outstretched blissfully. Miss you, Amelia! 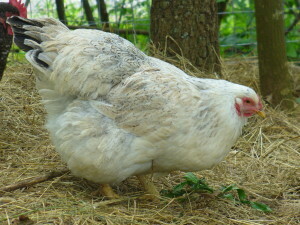 ​Evangeline came through our gates from a backyard "chickener" who wanted to get rid of her for her lack of egg-laying. Upon our initial examination we discovered that she had an old eye injury which left her with compromised vision in one eye. Active, alert and ever patient and gentle, Evangeline was beautiful both inside and out. She graced us with her delightful presence. We miss you beautiful lady. ​​Sparrow arrived here with the given name of "Spooky," but we just didn't think she was spooky in the least, thus her current, more fitting moniker of Sparrow. She was a born adventurer possessing a lot of courage and curiosity as she would run off to explore the furthest reaches of the goat pasture, vocalizing her enjoyment of the experience all the while. She waited for no one and was as fast as lightning. How we cherished our little Sparrow bird. We miss you! ​​Gaia was rescued, lost and confused after a storm, in front of a busy downtown storefront by a Full Circle volunteer (she is the one pictured here with more white feathers on her body). Gaia was part of a team (along with Earthie) who kept a sharp eye out at the sanctuary and she was always quick to sound the alarm should any disturbances arise. All of us here - especially Earthie! - miss you sweet lady. ​​Noah (along with Zephyr the goat and Penny the pig) was one of the trio of animals from the Asheville Humane Society who would become Full Circle's inaugural rescuees. At first Noah was, understandably, frightened and unsure of his surroundings and would run away whenever approached. 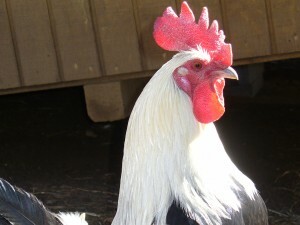 As Noah has blossomed into a large and most handsome rooster, he has also become quite friendly and approachable. He loved guarding over his flock of hens, ever watchful of the sky, sounding warning signals when a hawk soared above, and calling the hens over to share a tender morsel he had discovered on the ground.